Rogue Trooper is a science fiction third person shooter based on a British comic. When I was young I read Spider-Man fanatically but I also bought a comic that had stories of the Rogue Trooper. They were the stories I liked the most. The hero is a genetically engineered soldier with no past, created in a lab to participate in wars. Unfortunately, his first mission is a disaster and all his comrades are massacred. The only one who survives is the Rogue Trooper, who discovers the mission failed because of treason at the highest level. Now he has to find the traitor and bring him to justice. To accomplish that he must travel alone in hostile territory and confront armed forces without expecting any help from his country. The guy who handles your inventory allows you to build new guns, upgrade the weapons you already have, create ammo and craft health packs. To do that you need resources you find scattered in the environment. Another comrade lets you hack into electronic equipment, such as doors or consoles. This is necessary to progress in the game. The third one can become an automatic machine gun or a decoy but I found those functions redundant. 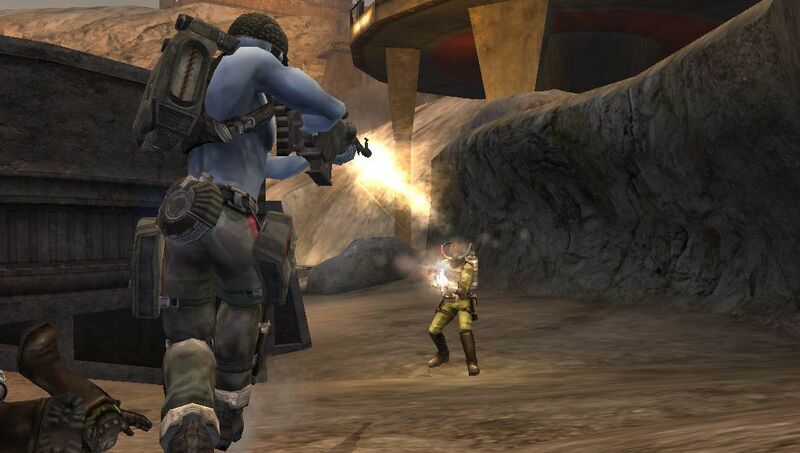 Rogue Trooper is fun for many reasons. First of all, I liked the hero: his ordeal, being deserted and facing mortal dangers to avenge the death of his comrades makes him respectable and human. The brief dialogues between his friends (the chips they are integrated into can talk!) add some well placed comic relief to the grim reality of the story while the plot is good enough to keep you interested in the hero’s journey. The game plays like a first person shooter, which means you run with the left analogue stick and aim with the right stick. You can also duck, climb, jump and seek cover behind objects, walls and rocks. During the beginning of the adventure you find comrades of yours who have been gravely wounded and keep them “alive” by transferring their conscience into a microchip. This way you continue your journey with good company. Moreover, every comrade-chip gives you new abilities. 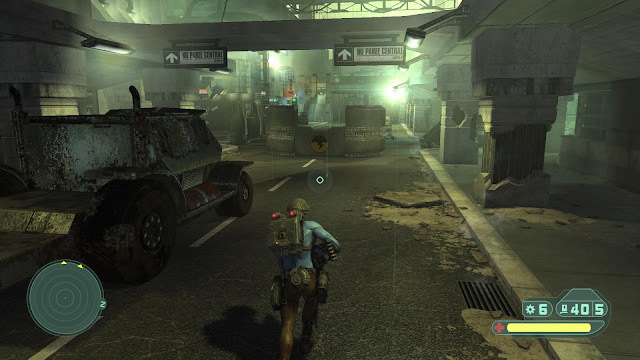 The gameplay is excellent, as you face enemy soldiers of different types and forge your way through military bases and fortified urban areas. The precise, practical controls and the variety of guns, such as assault rifle, lighting gun and homing missile launcher, help you deal with any situation effectively. The level design keeps things fresh and there are many satisfying moments, such as using the rifle’s scope to take out snipers or shooting down flying troops by handling a turret mounted on a train. The difficulty is reasonable and although sometimes you are shot from different directions the game is never unfair. You save only at the end of a stage, however, checkpoints appear regularly. Health is replenished to a degree automatically and you have so much resources at your disposal that it is impossible to run out of health packs or ammo. However, this does not mean that you can finish a mission just by running and shooting. You have to take into account the position of your foes and be careful not to be surrounded. Also, don’t forget to upgrade your equipment and remember that the lightning gun can hit multiple soldiers at once! Concerning the graphics, the buildings you explore combine future technology with crude architecture while the open areas and the sky create the feeling of a planet long dead. The colors used are mainly blue, brown, yellow and red, giving the game its own visual identity. 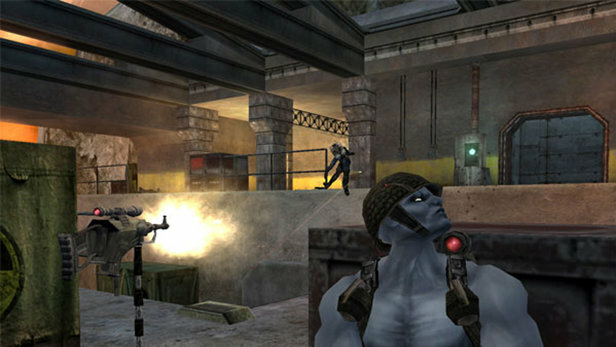 Enemies are designed to look ruthless and the visual effects are adequate. Generally, I loved the game’s atmosphere. As for the sound, it is nothing to write home about but this didn’t bother me. Rogue Trooper is one of my favorite PS2 games, as it features plenty of brutal action, special artistic style and an interesting background story. There are even drawings and descriptions of characters, enemies and vehicles you unlock by accumulating points and I read them with pleasure, to learn more about the game’s world. 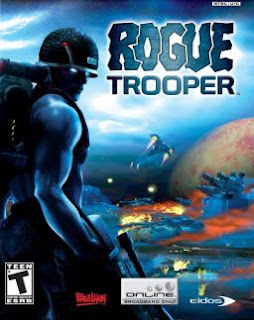 For fans of shooters and science fiction Rogue Trooper is a very good choice.